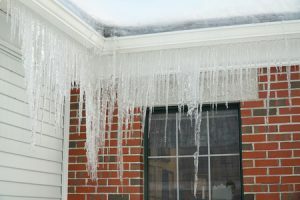 Are you looking for ways to control snow and ice buildup in your gutter system this winter? 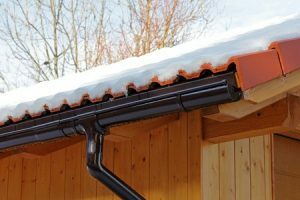 If so, you may have heard that “salting” your gutters can help. This process typically involves filling socks or cloth bags with rock salt, and then laying them inside your gutters to help melt ice and snow. This might seem like a good idea, but unfortunately it can actually do more harm than good. Today we’ll look at a few good reasons to think twice about using rock salt in your gutter system. Because the interior surfaces of your gutter system aren’t painted, they’re vulnerable to corrosion from rock salt. When water and salt wash through your home’s gutters, the solution will eventually chew holes straight through to the bottom. This will effectively render your gutters useless and force you to make repairs in the spring. Rock salt is also toxic to grasses and other vegetation. If your downspout discharges a salt water solution into your lawn, you could wind up with large patches of dead grass in the spring. If it discharges near shrubs or a flowerbed, it could also undo some of your landscaping efforts. Rock salt can also accelerate wear on concrete sidewalks and driveways. If your downspouts don’t discharge far enough away from your home, a salt water solution could even damage your home’s concrete foundation. 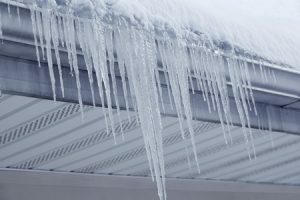 Ultimately, salting your gutters is not a viable solution to snow and ice buildup. 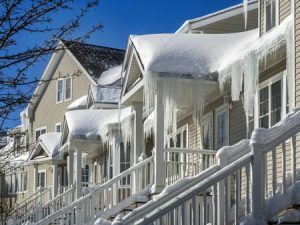 Instead, take steps to prevent ice damming on your roof and consider installing gutter guards to prevent solid debris from accumulating in your gutters during the winter.